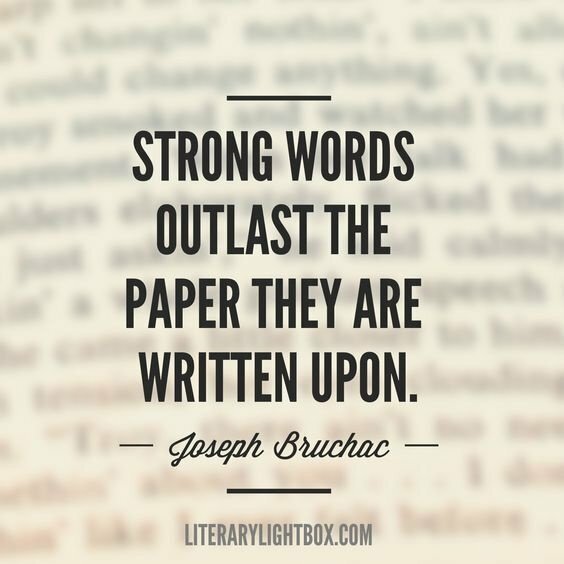 A good book is nothing without the incredible writer behind it. Books have always fascinated me with their abilities to tell stories of all kinds, to transport you for even a few minutes to a whole other world. I could--and do, when I have the time--sit for hours curled up with a good book, oblivious to the world around me but for the fictional one between my hands. I love talking with others about books. 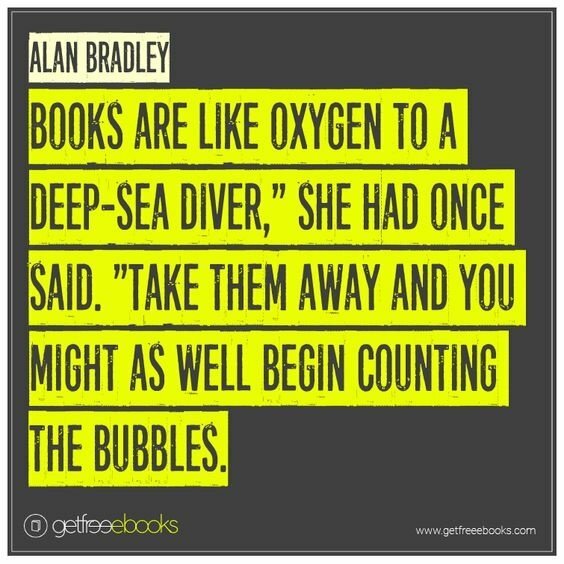 I could talk for hours about books, comparing opinions and recommending individual books or series. It's almost like a spell, to talk about something I love so dearly: like a wave of peace coming over me. 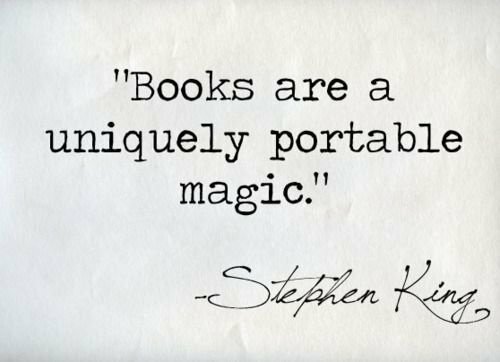 November 1 was National Author Day. Out of curiosity, I created a survey to see what my fellow writers would name as their favorite authors. And amazingly, not a single response that I got was the same. 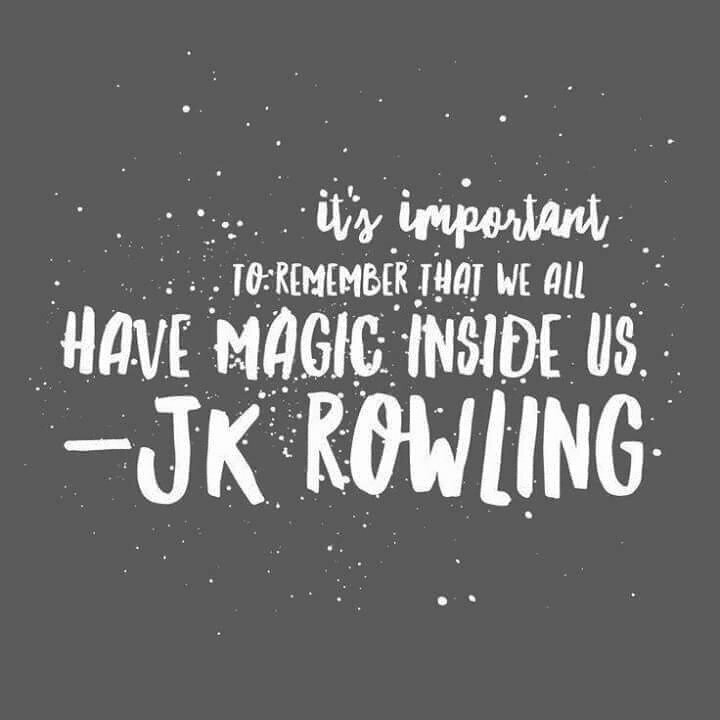 Fun fact: I used this as my quote for my high school graduation ceremony (we all had to choose one quote or phrase we wanted to be read as we walked to get our diploma). And as for me? I'd say JKR and Rick Riordan - both writers of series that turned me into the massive nerdy fangirl I tend to be nowadays. Both created whole worlds within the pages of their series, something I had never truly experienced before - at least, certainly not on the level I did with Harry Potter and Percy Jackson. 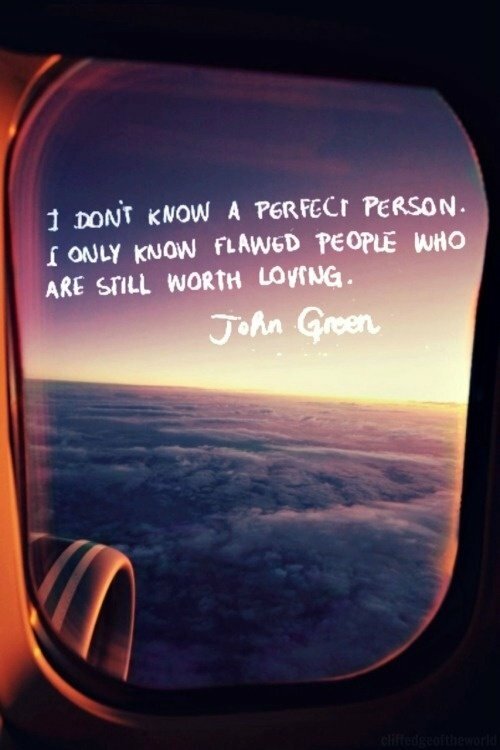 I'd also say John Green. 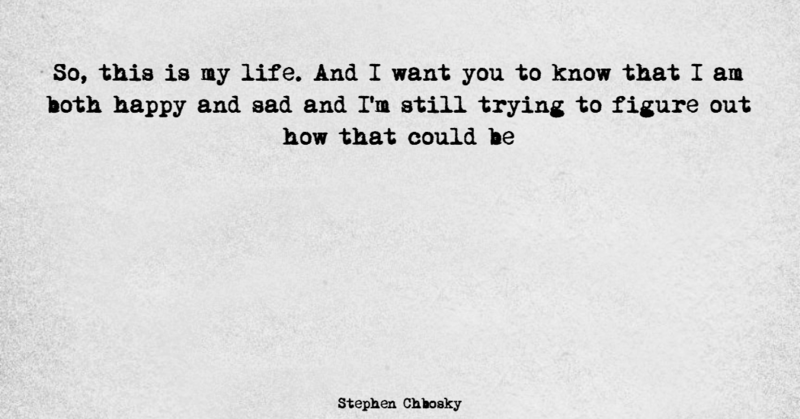 "The Fault In Our Stars" is really his only seriously cheesy book. "Turtles All the Way Down" really got into what it's like to live with anxiety and OCD in an almost visceral way, and that meant a lot to me. As someone who has lived with anxiety from a young age, to see a writer use their wide readership for something so big meant a lot. 12. 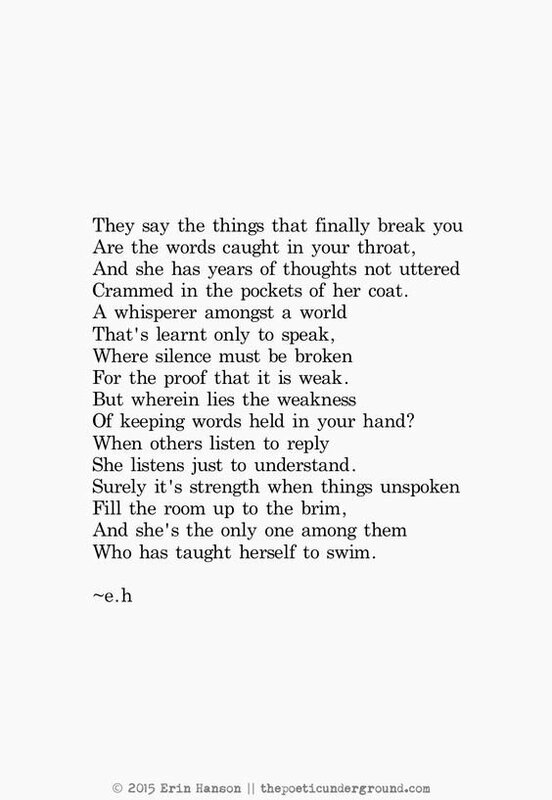 I might not have said those four words in the old and standard way, but I'd learnt that actions speak much louder, than anything that you can say. 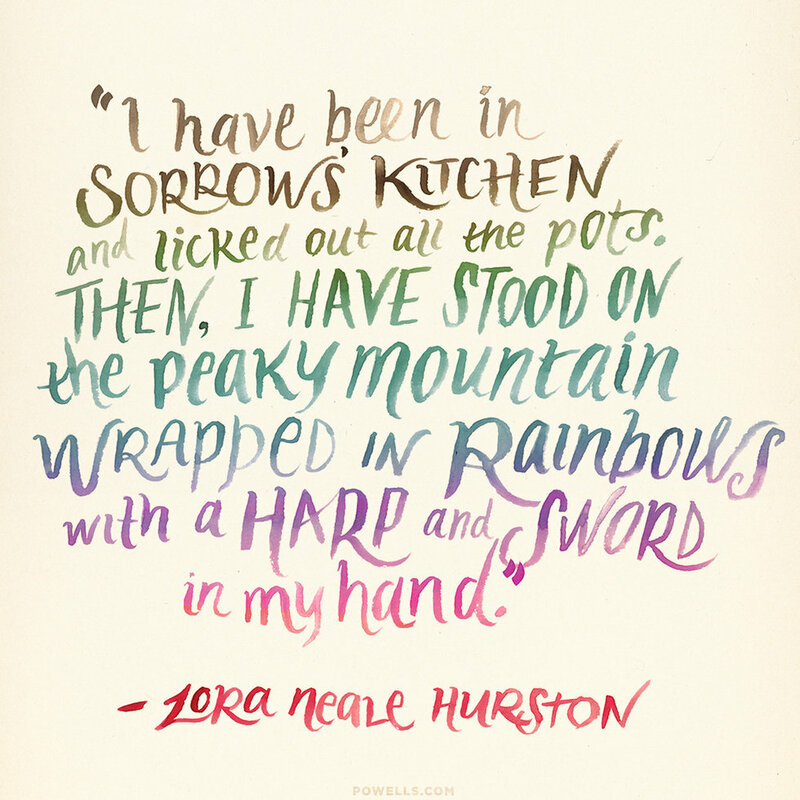 So much has happened this week, yet I could not find any inspiration to write. Instead of creating a piece that I will never deem perfect... 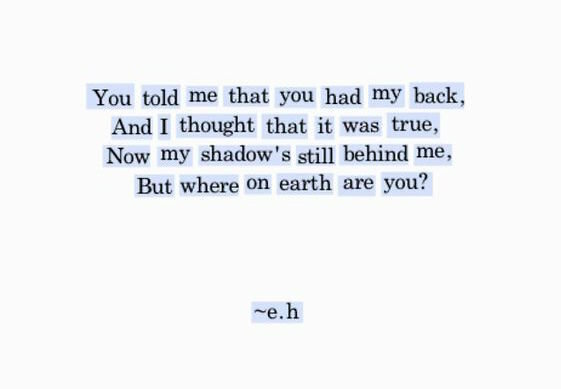 I have decided to share with you my favorite e.h poems that fill my Pinterest board. These poems always seem to speak the words that I could never write, they remind me that I'm not alone, and give me faith to keep moving forward... 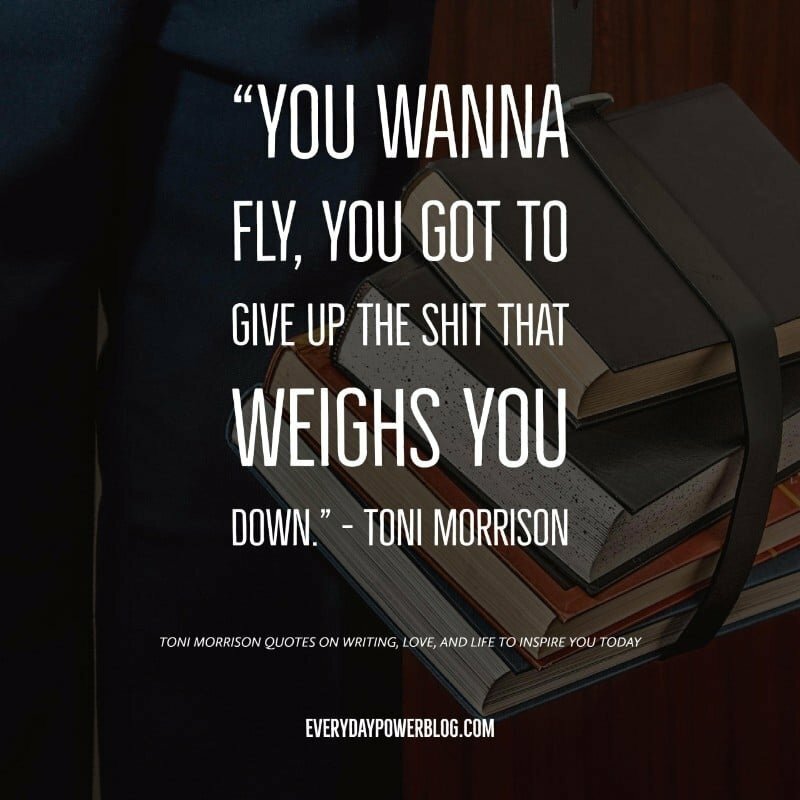 I hope they do the same for you. 1. 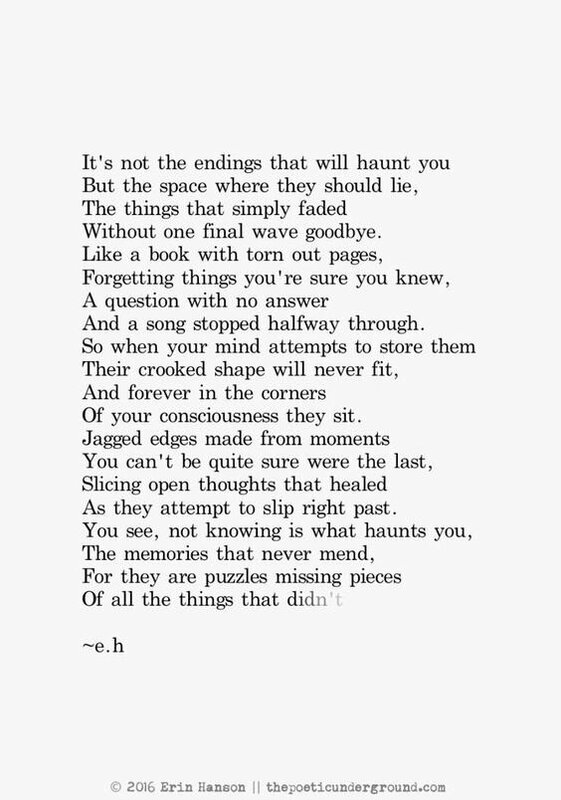 You see, not knowing is what haunts you. 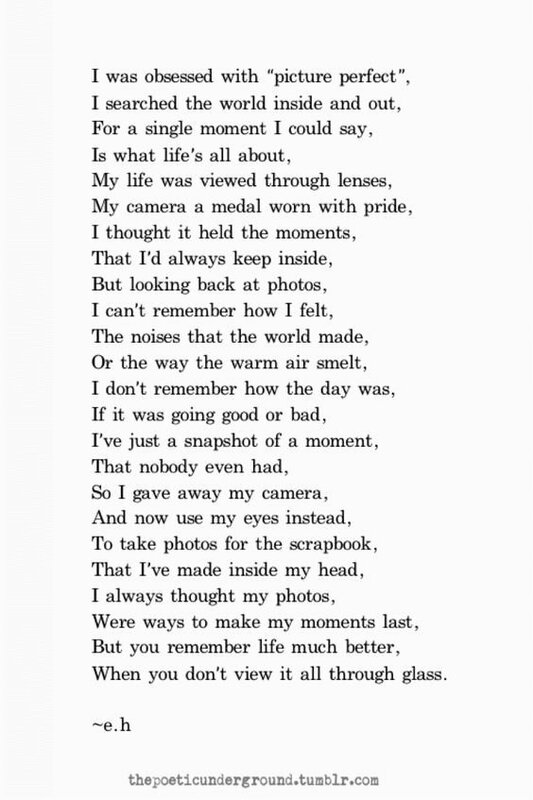 The memories that never mend. 2. When others listen to reply, she listens to understand. 3. 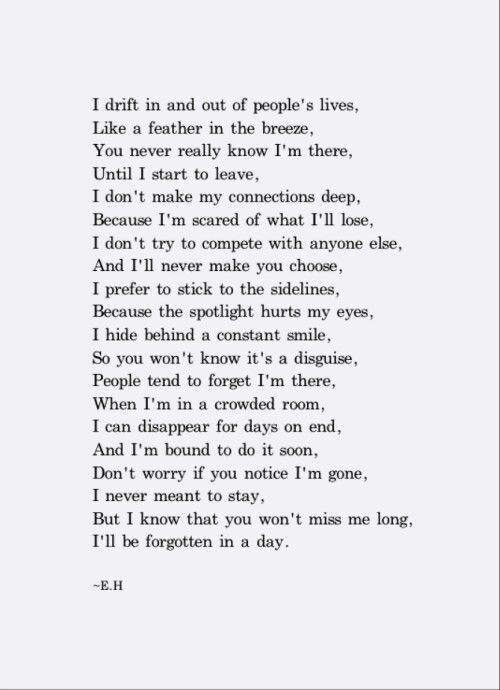 I don't make my connections deep, because I'm scared of what I'll lose. 4. 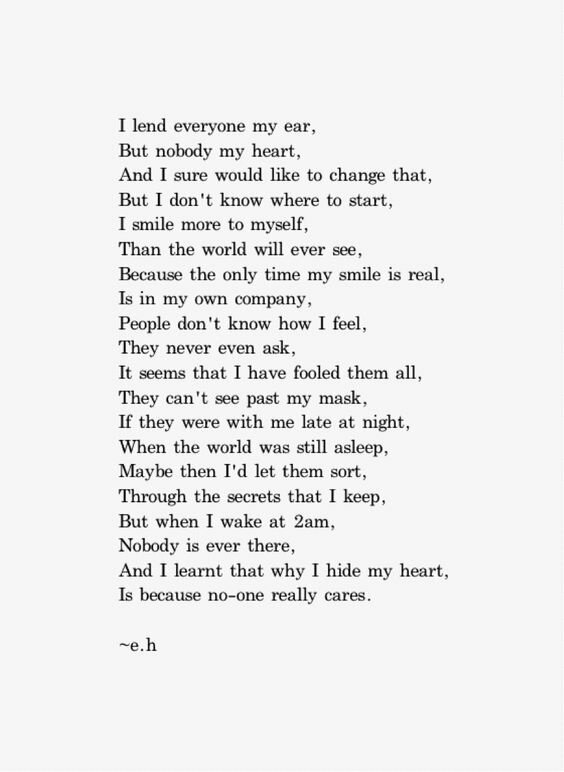 I lend everyone my ear, but nobody my heart. 5. 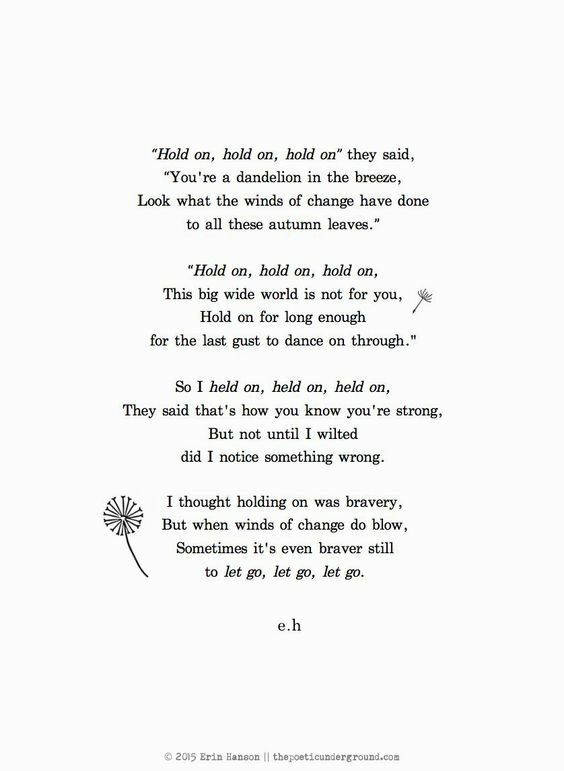 Let go, Let go, Let go. 6. 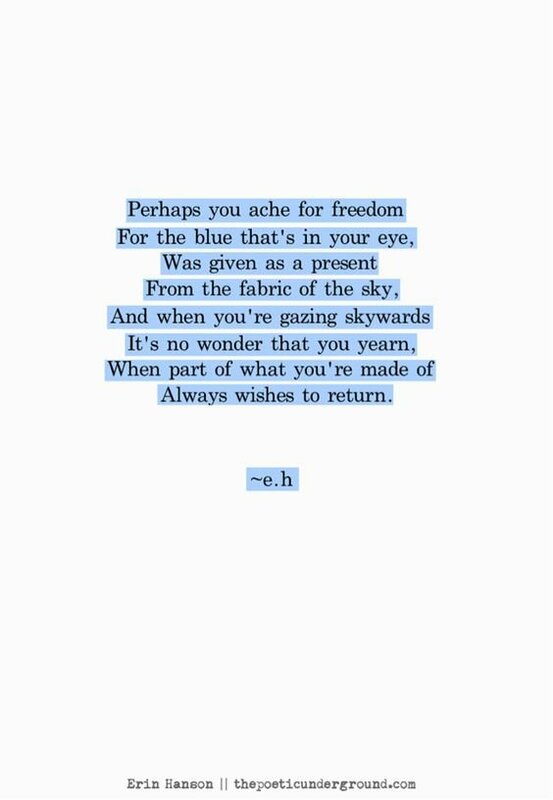 When part of what you're made of always wishes to return. 7. 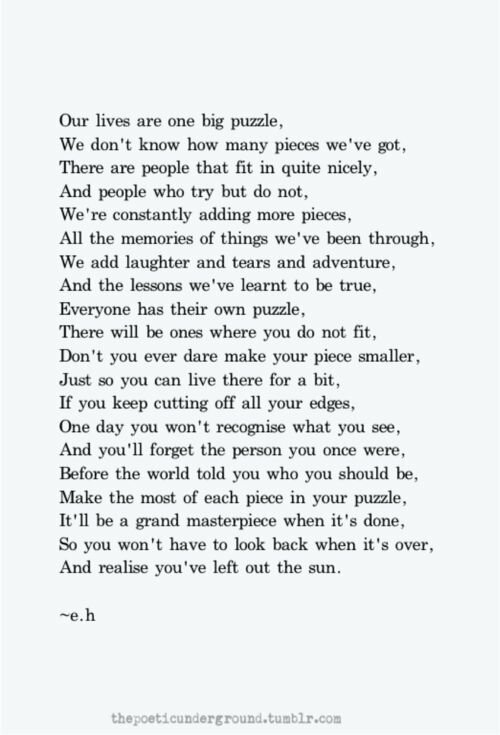 There are people that fit in quite nicely, and people who try but do not. 8. 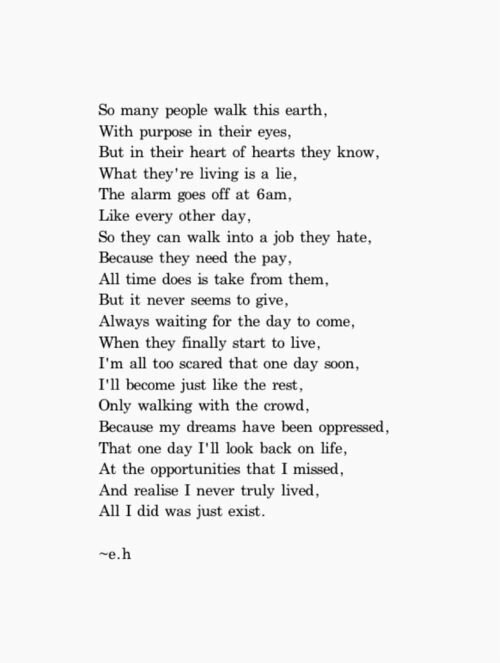 And realize I never truly lived; all I did was just exist. 9. 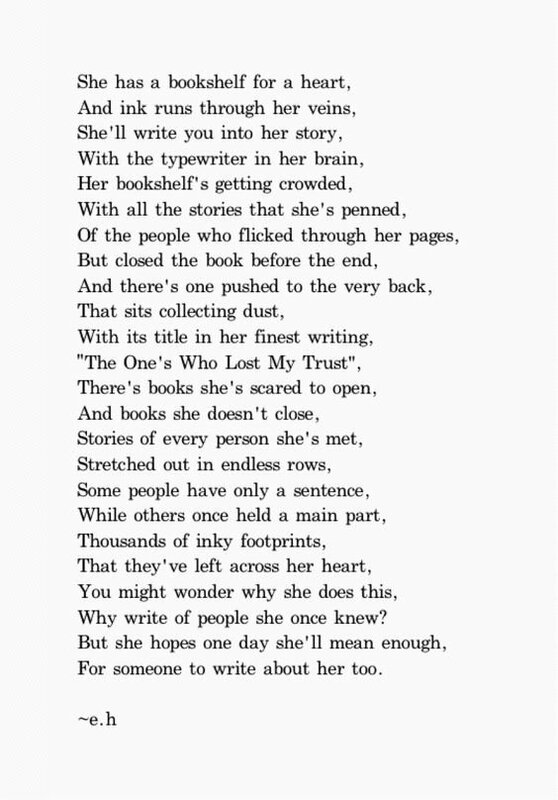 She hopes one day she'll mean enough, for someone to write about her too. 10. 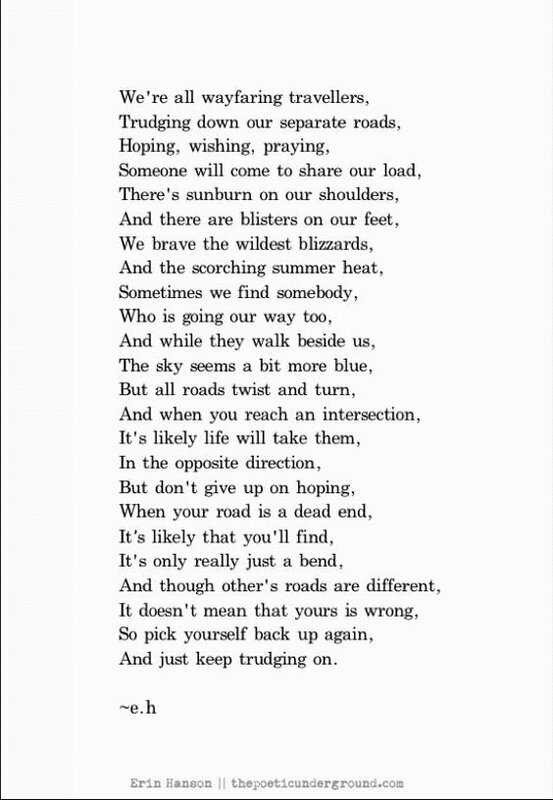 When your road is a dead end, it's likely that you'll find it's only really just a bend. 11. 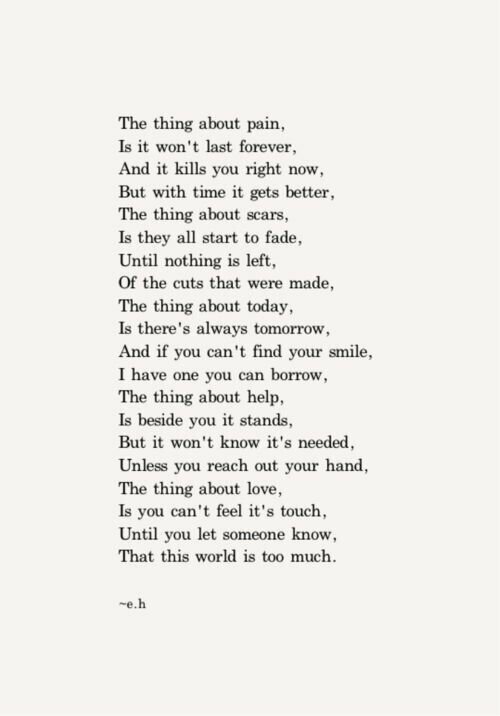 And it kills you right now, but with time it gets better. 12. 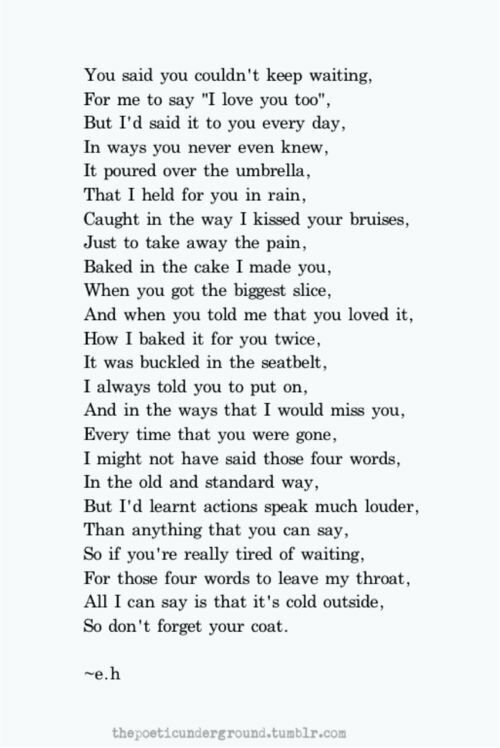 I might not have said those four words in the old and standard way, but I'd learnt that actions speak much louder than anything that you can say. 13. 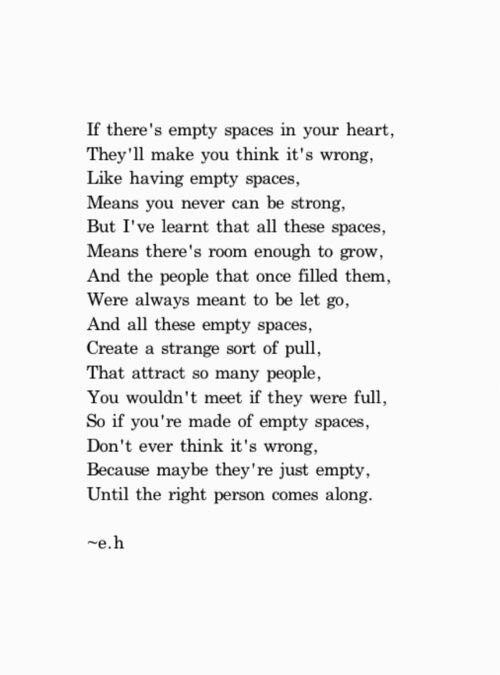 All these empty spaces create a strange sort of pull that attract so many people you wouldn't meet if they were full. 14. You remember life much better when you don't view it all through glass. 15. 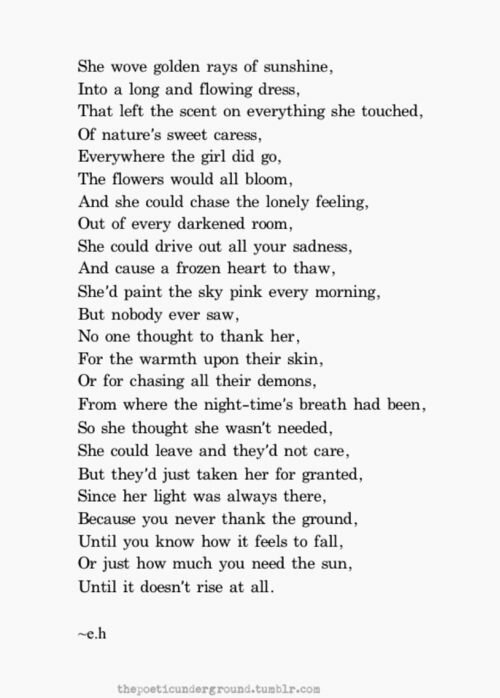 She thought she wasn't needed, she could leave and they'd not care. 16. But where on earth are you? 17. 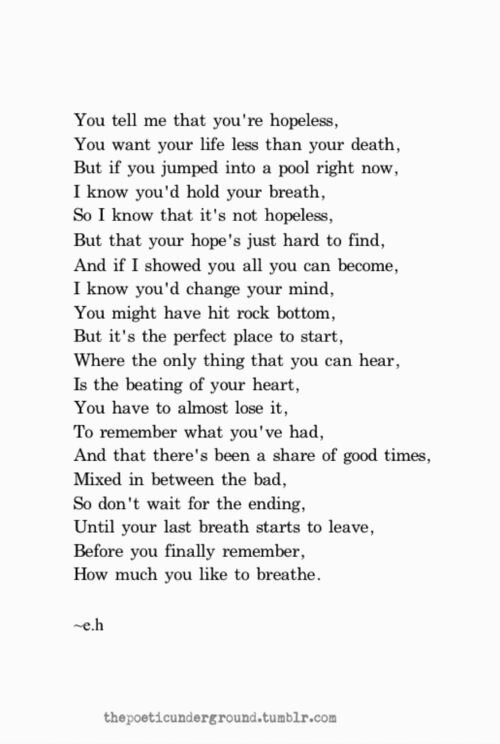 You might have hit rock bottom, but it's the perfect place to start. 18. 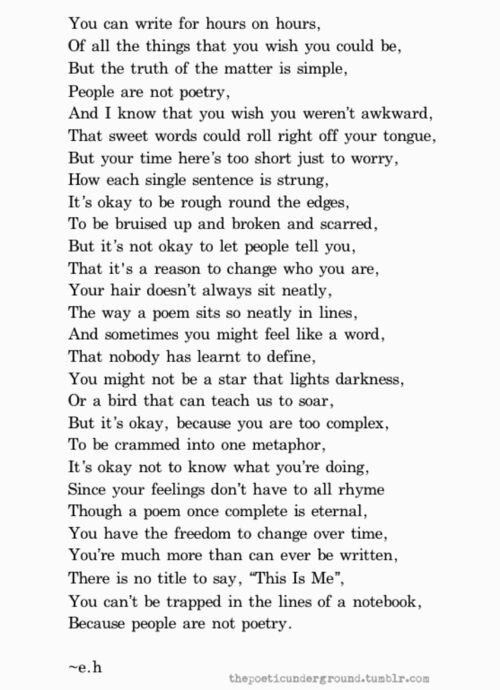 There is no title to say, "This is Me." 19. 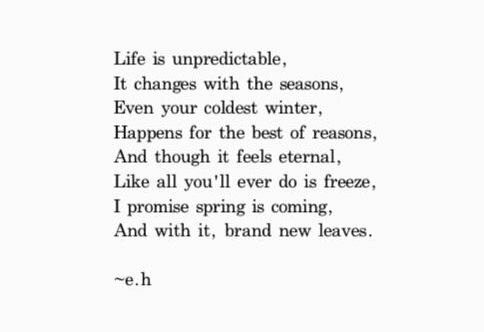 I promise spring is coming. 20. 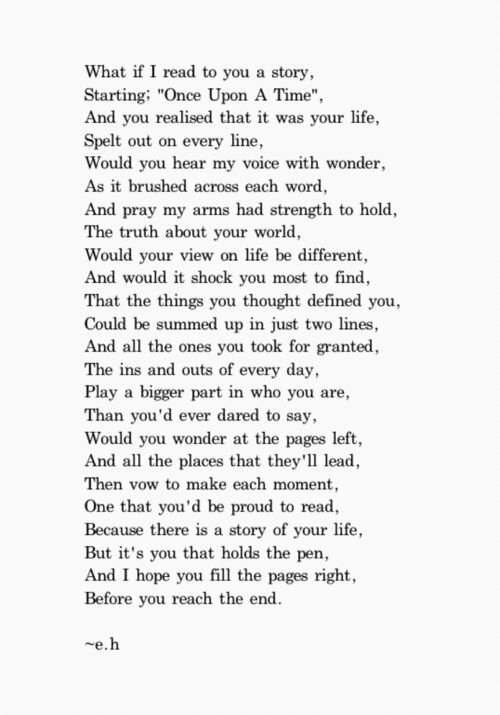 Would it shock you most to find, that the things you thought defined you, could be summed up in just two lines. 21. 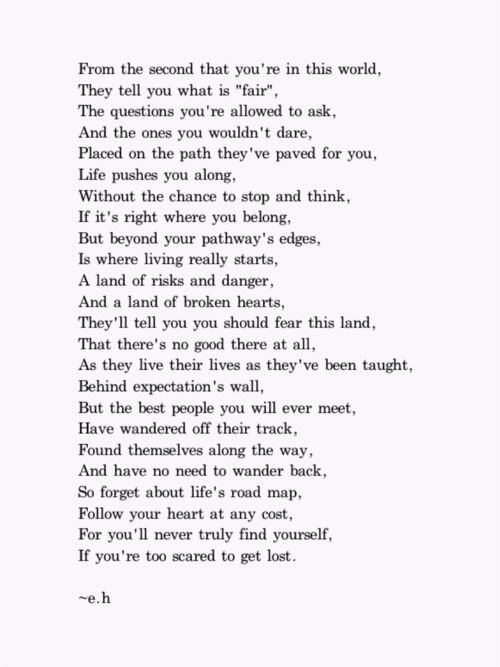 For you'll never truly find yourself if you're too scared to get lost. 22. 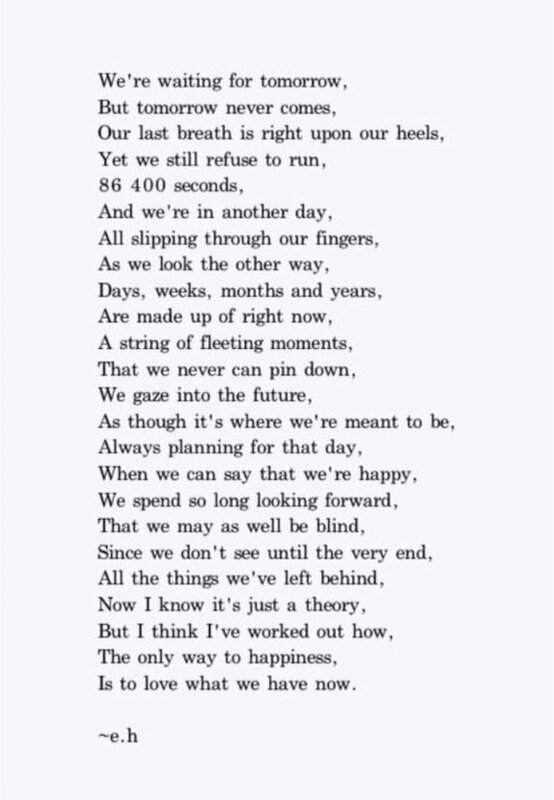 86,400 seconds and we're in another day. 23. 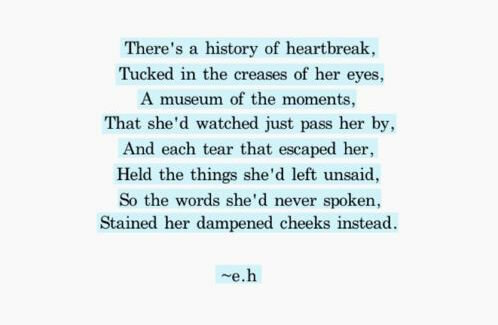 And each tear that escaped her held the things she'd left unsaid. 24. 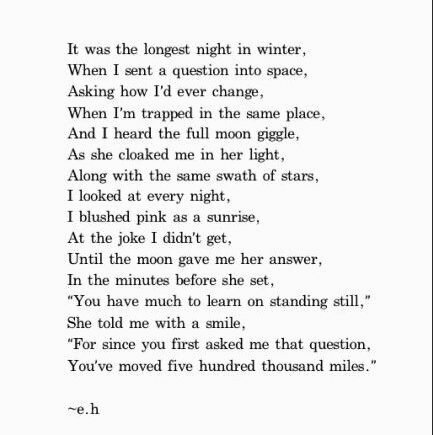 For since you first asked me that question, you've moved five hundred thousand miles. 25. 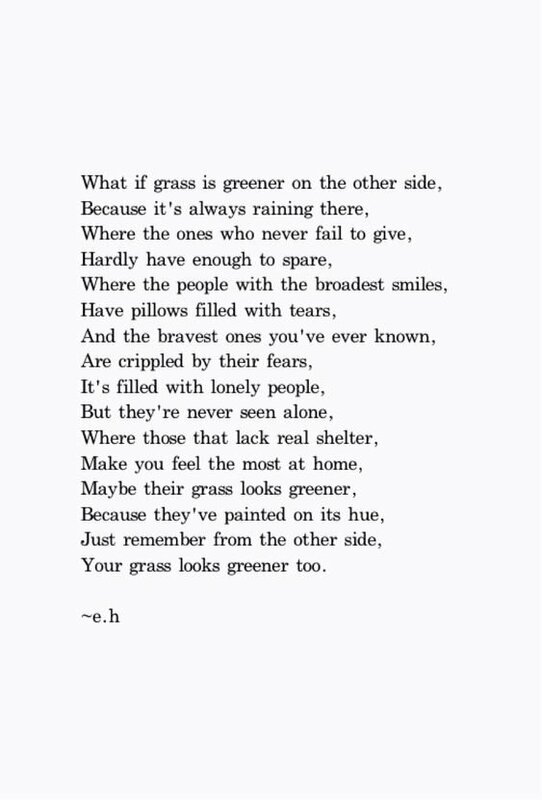 Just remember from the other side, your grass looks greener too. The new romance movie of spring is finally here and I'm so excited! If you've gone to the cinemas recently or even checked your social media accounts, odds are you've seen the trailer for the new movie, "After." It's a fanfic-turned-novel that's been adapted into the newest young adult romance sweeping across the globe. This series has fans EVERYWHERE and I honestly don't know how, as part of the book lover community, I didn't even know about the series until a month before it came out. I must have been living under a rock because I am officially OBSESSED with this fandom! "After" is the typical good girl/bad boy scenario, but with a fresh perspective and twist. Tessa Young is starting her freshman year of college with everything in order. She's declared a major (English majors assemble! ), has the sweetest boyfriend in the world and organizes her life down to the last minute. 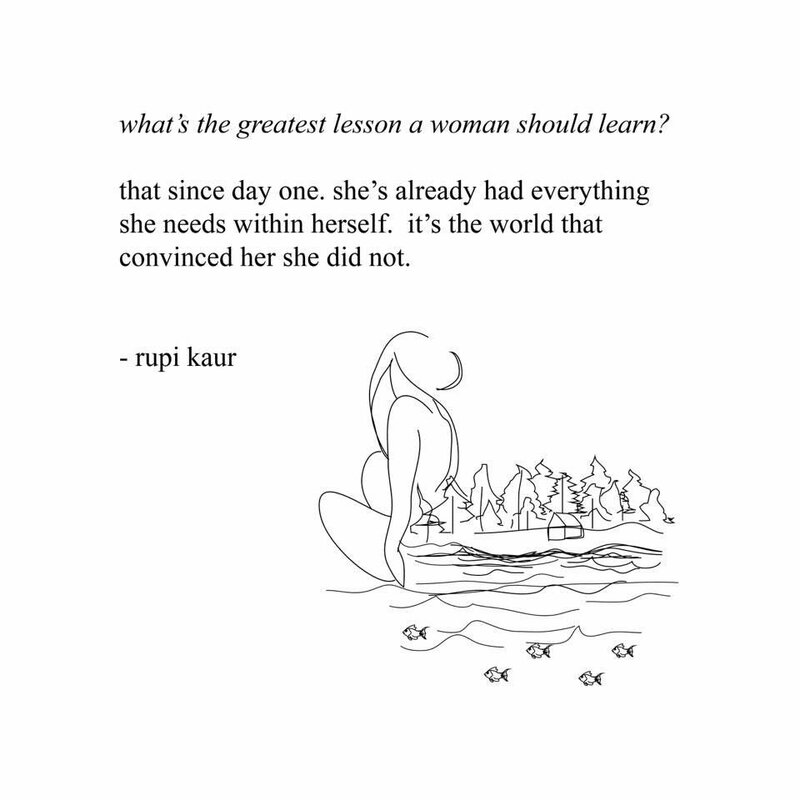 Essentially, she's me, but she lives in Washington instead of Virginia. Hardin Scott is the resident "bad boy." He's all tatted up, wears the same black or white t-shirt almost every day, and has a steady stream of girls...but NEVER a girlfriend. Oh, and get this - he loves reading! Major Mr. Darcy vibes are dedicated to this dude because he's brooding, stylish, and British. 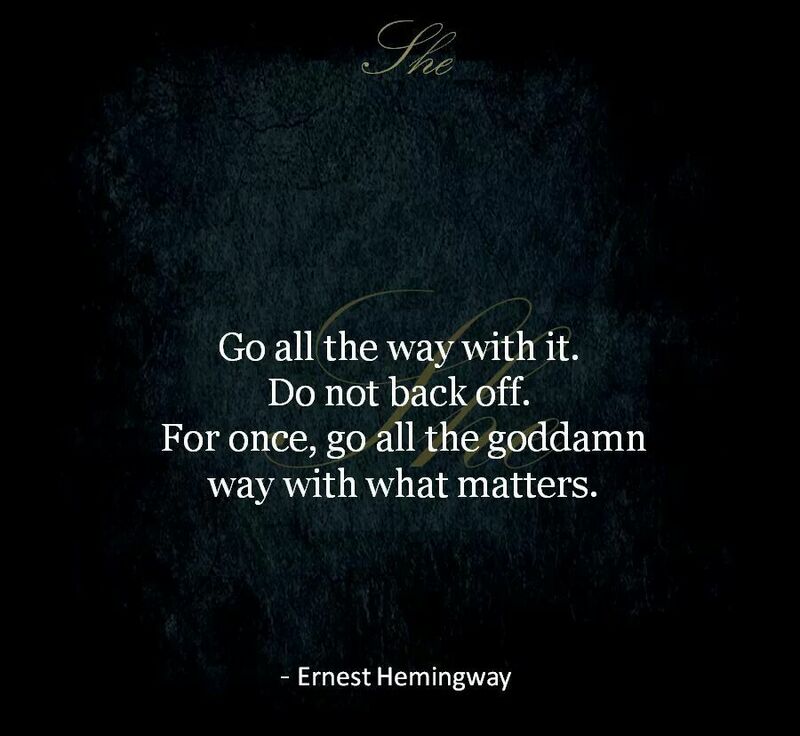 Of course, the two meet and sparks quickly fly - both from romance and anger. 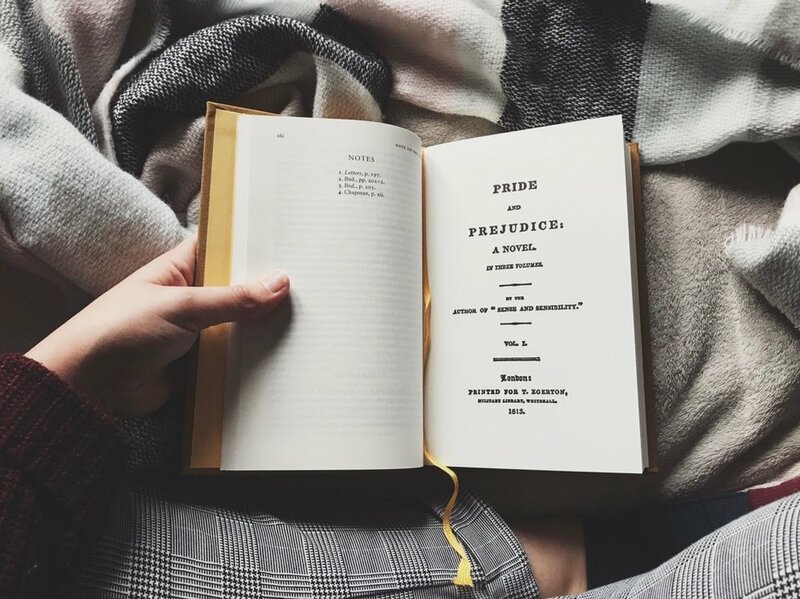 Like Mr. Darcy and Elizabeth Bennet from Jane Austen's "Pride and Prejudice," the two don't get off to a very smooth start, but they eventually work their way into a steady relationship. Well kind of. Remember when I said Hardin doesn't have girlfriends? Well, that becomes a problem pretty quickly and is the source of a lot of stress for most of the book. Without giving the entire premise of the book or movie away, I will say that this is your typical college romance, but there are a few twists and turns surrounding Hardin and Tessa's turbulent love. Regardless, you can't help but root for the unlikely pair (who doesn't root for the unlikely couple in romance movies tbh). The movie recently came out in the United States and it's still making its way around the globe. There is a MASSIVE fanbase who's been around since the novel was first published online on the fanfiction forum, Wattpad. Since then, Hardin and Tessa's story has reached over a billion people and has its own complete series of five books with a spin-off duology about one of the novels other characters. The movie is bound to have major success, with two fairly new actors to the U.S. screen. Josephine Langford is our Tessa Young. You may recognize her from the 2017 thriller "Wish Upon" or the Australian TV series "Wolf Creek." She is also the sister of "Thirteen Reasons Why" actress, Katherine Langford. And Hero Fiennes-Tiffin is our Hardin Scott. Hero starred as the young Tom Riddle in "Harry Potter and the Half-Blood Prince." His last name may sound familiar and that's because his uncle, Ralph Fiennes, actually played the adult Tom Riddle/Lord Voldemort in the HP series. Needless to say, I think these two young heartthrobs will do Tessa and Hardin definite justice when fans and moviegoers see them on the big screen. I've been copiously searching for new scenes and footage leading up to the movie's release and if I can say anything, it's that this flick will be a treat!